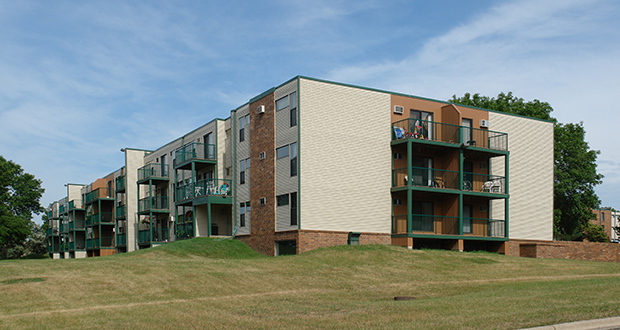 The five-building Emerald Park apartment complex in Bloomington is an example of a development that a new $25 million affordable housing investment fund may have been able to help purchase to ensure it stayed affordable, according to Warren Han-son, president and CEO of the Greater Minnesota Housing Fund. A new investment fund aimed at preserving thousands of affordable housing units in the metro area got a $3 million boost Tuesday when the Hennepin County Board of Commissioners voted to support the effort led by the Greater Minnesota Housing Fund. The Hennepin County resolution sets aside $3 million to help save 1,000 affordable units over the next 2½ years. The money will be part of a new $25 million fund created through contributions from the McKnight Foundation, the Greater Minnesota Housing Fund and other philanthropic, bank and private partners, said Warren Hanson, president and CEO of Minnesota Housing. Developers interested in purchasing existing low-cost units would have access to the money through a 10-year, low-interest loan that would cover the equity investment needed to purchase and maintain affordable housing for at least 15 years. The unanimous Hennepin County vote comes as rental vacancy rates in the Twin Cities and surrounding suburbs have fallen below 3 percent, drawing national investors who want a piece of the area’s hot rental market. Meanwhile, families and individuals who need affordable housing are increasingly feeling the squeeze as “naturally occurring” affordable housing, or older units with fewer amenities, are scooped up by investors to be made new — and more expensive. The fund could have helped save existing Class C apartments in the area, including the Crossroads at Penn in Richfield or the Emerald Park apartment complex in Bloomington, Hanson said. The Greater Minnesota Housing Fund plans to get to work as early as this fall to support investors who want to keep low-income housing affordable. The nonprofit is also working on securing another $25 million that would help preserve a second batch of 1,000 affordable units in the area within the next five years. The key to making the fund work will be speed, said David Wellington, director of acquisitions and development at Wellington Management. The St. Paul-based developer is currently building 135 units of new affordable housing at 3120 24th Ave. S. in Minneapolis’ Corcoran neighborhood and also works in commercial real estate acquisitions. The Greater Minnesota Housing Fund is aware of the fast-paced market, Hanson said, adding that developers who borrow from the fund would be able to access money within 45 days. The money is a good step, but it’s a small amount compared to the need, said Thomas Schuett, president and CEO of Schuett Cos., which manages 16 affordable multifamily properties in the state. “There [are] more projects than there are funds, so any new fund that gets created with the goal of preserving affordable housing is absolutely necessary and I’m sure every dollar will get spent,” he said. The resource could potentially be something the company would consider using when purchasing future buildings, including affordable senior housing, which is in high demand regionally, Schuett added. Of the Hennepin County money, $1.15 million is being reallocated from transit-oriented development projects that received county money in past years, but never came to fruition. Another $1.1 million will be allocated from an anticipated land sale this year to L&H Station Development, a joint venture be-tween BKV Group and Launch Properties. The development group is working on a multi-phased project to build 550 residences on county-owned land at Lake Street and Hiawatha Avenue, adjacent to a planned “transit village” and county human services building. A final $750,000 would come from the county’s 2017 budget, but officials haven’t yet identified the exact funding source. The investment is modest and will have a huge payback, said Hennepin County Commissioner Peter McLaughlin in an interview Tuesday. “For $3 million … we’re leveraging seven to one private resources that would otherwise not be available for preservation of affordable housing units,” he said. Read the story at Finance & Commerce.